I’ve always been of the mind that a successful film should be able to stand on its own as a unique and accessible work regardless of its place within an ongoing series. This opinion and its application is, of course, subjective, but I’ll be the first to argue that the Star Trek, Phantasm, and Antoine Doinel films can be enjoyed without any prior knowledge of their established mythologies. I’d say the same is true of the Harry Potter films with the exception of the newest one, which is so steeped in back story and fan fulfillment that only Rowling obsessives need apply. The film opens with the briefest of recaps of its predecessor before it plunges headlong into a series of dull expository sequences with murky gray visuals to match. The magical devices of the previous films are all present and utilized: the invisibility cloak, the morphing potion, the dragon, the goblins, the time traveling cauldron. This attempt at a culmination of everything the Potterverse has taught us actually backfires since it was the sense of discovery that accompanied these objects that made them interesting in the first place, I found no joy in seeing them used again to now predictable gains. The reveals that viewers have anxiously been waiting are now laid bare, but in the form of confusing flashbacks and repetitive intercutting between Potter and his evil nemesis. Even the deaths of some of the film’s central characters are anticlimactic, after seven films they certainly deserve more than quick reveals on a slab (other central characters disappear from the story just as quickly, the most interesting of which is Hagrid who was pretty much the main character in the first film, but has now been reduced to barely five minutes of screen time). The fact that the material is based on a book is hardly an excuse, but I’ll admit that the fact that there’s a “Part 2” in the title makes my overall point moot, but not my criticisms. Writing a negative review of this film is ultimately pointless, it’s too late for newcomers to the series to care about it and the diehard fans will see it regardless of anything. I personally found it to be a dreary disappointment though the epilogue provides a fitting end note that recalls the magic of the early films. 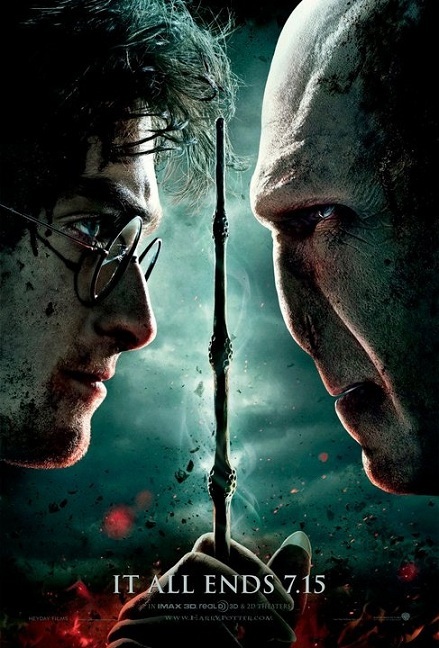 Harry Potter and the Deathly Hallows Part 2 opens wide in Philly-area theaters today. P.P.S. At the advance screening for this film we sat next to a Potter fanatic (complete with wand and digital tablet with the books cued up) who kindly explained to me what the Horcruxes and Deathly Hallows actually were (it wasn’t that I didn’t understand them, it was just that I never cared to). Here’s her review of the new film, which ends with a mention of some sort of online continuation of the series, surely at least a slight comfort for the saddened masses.